When you look at all the destinations offered by the Law School at Southampton for a year abroad, Nova Scotia, I think it’s fair to say, doesn’t exactly jump out at you. The first time I told people I was going there for a year the usual reaction was “oh that’s great! – Where’s that?” It didn’t start out too great either, my Study Permit wasn’t processed in time so I arrived late… my main advice – Sort your travel documents out early. Since I actually arrived, it’s been incredible, the year has exceeded my expectations, mostly due to meeting a fantastic group of people but for my first post, I’m going to stick to describing Dalhousie University, Halifax and Nova Scotia, to give anyone who’s interested an idea of what living and studying here is like. The first thing to point out is that the Schulich School of Law is pretty separate from the rest of Dalhousie and is a community in itself, this is because the Law School is a graduate school and it becomes pretty apparent that you’re surrounded by people older than you. The workload is tough at the Law School but it’s not overwhelming and the range of courses makes it easy to find something you’ll be interested in. When you first arrive at Dal you’ll have a week of “orientation” – which isn’t like Freshers Week, at all. First of all, you can’t drink on campus and most of the activities are a little underwhelming, fortunately, there’s no shortage of things to do in Halifax, particularly in September. The Law School offers it’s own Orientation Week which includes Surfing at Lawrence beach, hiking at Cape Split, a Boat Party (definitely recommended) and a meal out with the school on the waterfront. The University also runs it’s own intramural sports teams and has fixtures against one of five other universities in or around Halifax. The International Centre also organises trips to see Ice Hockey matches for the Halifax Mooseheads and the Dal Tigers. The same centre is also a great way to meet the other exchange students. Halifax is roughly the same size as Southampton, so it’s not too hard to get around especially since the Halifax peninsula has pretty much anything you’ll need. The city has a lot of bars and pubs downtown, loads of small cafes and plenty of restaurants. Make sure to explore the city when you first arrive to get a taste for all the things you can do there. Halifax has pretty decent nightlife on the waterfront, but if you aren’t into bars or clubbing there are also a load of other activities such as Bowling, Escape Rooms, Go Karting, Mini Golf, two cinemas as well as lots of lakes nearby which are great when you first arrive and it’s still warm. For me the province of Nova Scotia was the most surprising part about my trip so far, I didn’t know much about it and really only explored parts of it by accident at first. Cape Breton Island is a must visit, particularly in the Autumn, especially if you like hiking. Cape Split and Peggy’s Cove are also worthwhile trips with some amazing scenery. It’s definitely worth hiring a car to drive around Nova Scotia, especially if you can befriend some Europeans who can drive you on the right side of the road, because while Halifax Airport is nearby flights to Toronto and Montreal etc aren’t too cheap so it’s good to go on some cheaper more local trips and see things in Nova Scotia that you may never get the chance to see otherwise. I hope you enjoyed my first blog post, I’ll probably write at least two more and upload a load of pictures taken soon. 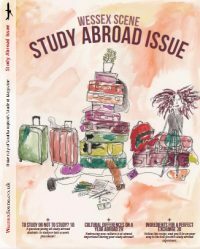 I hope it may at least help you to consider applying to go to Halifax for your year abroad.